Charles Folis was notable as a speedy running back in 1899, a year when the Wooster High School football team was undefeated. 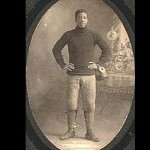 Later, as a member of the powerful Shelby Blues, he was the first black to play football professionally. Follis’ career was ended prematurely by an injury sustained on the field of play.